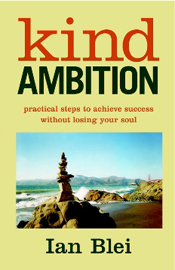 Kind Ambition is about you having the tools to slide over to the driver’s seat of your own life. Circumstances will always be changing, seemingly thwarting our plans, but we don’t have to be thrown around by them. You can be in charge of your choices and actions more than you might imagine …yet. If you prefer to use checks or credit card, please contact me, and we'll take care of it over the phone. "We all face obstacles in our lives and careers. Some of these come from within, subverting our conscious intentions. The good news is: they can be overcome. The techniques and processes found in this book will help you on your way." "Ian Blei shares his deep insights in simple and straightforward ways. His work continues to inspire me whenever I feel I'm getting stuck in some area of my life."